Dumisani Kumalo. Photo © Rick Reinhard. When Dumisani Kumalo first came to the United States in the 1970s, he was persona non grata at the South African Mission to the United Nations, then an outpost of the apartheid government. Today he represents his government there. As South Africa's permanent representative to the United Nations, Kumalo draws on his experiences and contacts as a key organizer for the divestment movement around the United States in the 1980s. Dumisani Shadrack Kumalo was born in Kwambunda village on the banks of the Blood River in KwaZulu-Natal. He grew up hearing stories of the infamous battle on December 16, 1838, when his forebears challenged the rifles and canons of the Boers, their flowing blood giving the river a new name. The stories centered on the great Zulu heroes of that battle, not on defeat but on coming victory. In 1947 the Kumalo family moved to Evaton, a township 25 miles south of Johannesburg, where Dumisani Kumalo grew up. His father was a carpenter and fundamentalist preacher, his mother a counselor and midwife who was also gifted in handicrafts. The poverty his family struggled against, and the degradation his father endured even at the hands of a relatively decent white employer, shapedhis childhood. His political consciousness was shaped early, as his father took him to hear Nelson Mandela and other leaders speak at political rallies. Without formal schooling, Kumalo's father had to pay someone to read the letters his wife wrote to him when they were separated by the migratory labor laws. The father vowed that all of his children would be educated, and those hopes came to rest on young Dumisani's shoulders. Kumalo attended Wilberforce College in Evaton, a school established by black American missionaries of the African Methodist Episcopal Church. The college produced African intellectuals and activists, and the apartheid government shut it down in the mid-1960s. Kumalo received his bachelor of arts degree from the University of South Africa and a master of arts degree from Indiana University, where he participated in a multinational foreign journalists' project in 1973-74. Like many others under apartheid, Kumalo experienced brutality and harassment at the hands of the South African police for wanting nothing more than a normal life. When his son Mandla turned four years old, the family held a birthday party. The children invited to the party included some whose parents were in detention. The police arrived in the middle of the night after the party and smashed all the toys Mandla had received. For a decade beginning in 1967, Kumalo worked as a political reporter for the Golden City Post, the World newspapers, Drum, and the Johannesburg Sunday Times. He was a founder of the Union of Black Journalists, one of many organizations that grew out of the Black Consciousness Movement. In 1976 he was hired as the first African marketing executive officer at Total Oil Company, but he left that job in 1977 when he went into exile. From 1978 to 1980 Kumalo worked as an international education program coordinator at the Phelps Stokes Fund in New York. From there he moved to the American Committee on Africa and the Africa Fund. As projects director for the organizations, Dumisani Kumalo became the " man on the road" for divestment, an indispensable organizer in the campaign to divest funds from corporations and financial institutions in the United States that were involved in South Africa. He traveled from state to state, from college campus to campus, educating ordinary Americans about South Africa and showing them there was something important they could do to support the freedom struggle. In the course of his travels, the South African-born Kumalo learned the United States- its local, state, and national political structures, and the role of nongovernmental organizations such as educational institutions, churches, trade unions, and civil rights groups. Building on the groundwork laid by organizers in the 1960s and '70s, he helped nurture a nationwide grassroots network demanding economic sanctions against South Africa. Despite a veto by President Ronald Reagan, the U.S. Congress overruled the president and instituted these sanctions in 1986. Soon after Nelson Mandela was released from prison in February 1990, Kumalo returned to South Africa for the first time in a decade and a half. He witnessed the historic elections in 1994 that brought the African National Congress (ANC) to power, and moved back to work for the government in 1997 as director of the United States desk at his country's Department of Foreign Affairs. Two years later he was appointed South African ambassador to the United Nations, the position he holds today. In the following interview, Ambassador Kumalo jumps right into the need to understand the movement against apartheid in the United States as something built by sustained organizing and coalition building across the country over many years. He emphasizes the importance of always working with both black and white constituencies, and reflects on the persistence of racism in the United States and how it affected the movement. The genius of the Africa Fund, he says, was that it insisted that divestment be a local issue. Kumalo emphasizes the necessity to take action against oppressive institutions and is critical of those academics and intellectuals who would endlessly seek " correct" solutions that remained abstract and untested. He reflects on what he learned as an organizer-the necessity to stay focused, to use a single issue to address universal concerns, to always stress coalition building. These skills learned in the anti-apartheid movement reinforce his work at the UN every day. In late 2002 he took the lead in demanding that the U.N. General Assembly be allowed to express its views on the then-imminent invasion of Iraq. As reported in the Sunday Times of South Africa, " Kumalo, representing South Africa as leader of the Non-Aligned Movement and the African Union, essentially opposed the US by requesting that debates on Iraq take place not behind the closed doors of the 15-member UN Security Council but in the General Assembly, where all countries could take part. He made it possible for the world to express its views on the US's intention to attack Iraq. Until Kumalo's intervention in October, the debate had been limited to the ambassadors of the US, Russia, China, Britain and France. No longer" (February 2, 2003). Many of Ambassador Kumalo's speeches at the United Nations are available online at the United Nations website. References to his earlier work as an organizer may be found in the American Committee on Africa and the Africa Fund archives, which are housed at the Amistad Research Center, Tulane University, New Orleans. Selected papers will be included in the Aluka online archive. For additional references see the African Activist Archive at www.africanactivist.msu.edu. KUMALO: The movement against apartheid in this country is misunderstood because it happened so suddenly and had such a great impact that people didn't stop to analyze it. It happened suddenly in a sense. It started way back in the '50s, but it moved at a nice pace, deepening and deepening, deepening all the time. And I think when it started capturing people's minds, it was something so good, so powerful, and so sudden that they didn't have to. I always try and think of people who we were in solidarity with, the movements that were there. When I came to join the movement, it was during Vietnam. There were demonstrations. In fact the first major demonstration I remember was a demonstration that was on Vietnam in Central Park, that brought in close to 100,000 people or something like that. But it began at the United Nations. And we marched from the U.N. down Broadway, all the way to Central Park. But it linked the struggle for freedom in South Africa, in Namibia, and in Angola. And these people were people who were into justice, into peace, and against war. One of the people who taught me organizing, in a way-another movement, which was very important, was the J. P. Stevens movement. Ray Rogers and those people were doing the J. P. Stevens movement and campaigns with banks and all of that. So when we did the bank campaigns and what have you, we had learned from them. So I'm just trying to say it was not an isolated movement that to me, at least in my experience, started on its own. The other thing that is very important at the same time was the churches-Tim Smith and the Interfaith Center on Corporate Responsibility. And so all these things were coming together. The anti-apartheid movement had tremendous solidarity support from all these forces for good. And that is the power and the impact of it. I was responsible for putting together coalitions around the country. Everywhere I went, the coalitions were made up of people who either had been trade union people who had done J. P. Stevens, people who were doing anti-racism work in their own neighborhood, some people who were veterans of the war. So we had a very fertile ground, which made it very easy for us. This is what makes this impact of this movement. Just to jump ahead and illustrate again, the reason why we have the biggest success of this movement, reversing the Reagan veto on sanctions, was precisely because we had this grassroots. The South African government-and I have colleagues [now] who were working against me [then], and they tell me they had focused their efforts in Washington, to lobby in Washington and what have you, but we lobbied on the ground. These senators and these congressmen were getting 10, 12 calls at the district office. I remember Senator Reid, who is leader of the Democratic Party. He owes his election to us. If you go look at his history, he was, at that time, I think, in Congress or just getting into the Senate at that time. And I know he's from Nevada, because Nevada-not Las Vegas-there was a movement there led by a guy called Senator Joe Neal. I don't know if he's still alive or not. But Senator Joe Neal was an African American senator, a very, very good politician in Nevada. And I think the capital is Carson, Nevada, if I remember very well. And these guys generated calls from these rural Nevada towns to Senator Reid. And Senator Reid became the one to join in the vote overriding President Reagan. So we knew in the Africa Fund by lunchtime that we would reverse the veto, even though the vote was in the afternoon. We knew, because we were counting on all these people. And these people are calling us from wherever they are. State Representative Joseph Mitchell up in Alabama, and we had those Alabama senators that nobody said we could get. Because they were getting calls from their local voters and their local people saying sanctions matter. And those people, we cultivated them easily because our movement was seen as an integral part of these movements of the time that were about justice, anti-capitalism, antiwar. It's a movement that was unique in that you'd go to campuses-I mean, I spoke to more than 1,000 campuses all over the country in all 50 states. It was amazing. Alaska, Idaho, those states where you didn't think-but these were people who were part of this movement. And our movement was just a very nice fit into what was happening. So it made my job easier. I had the easiest job around. Q: Why did it come to a head in the '80s? Apartheid had been a bad thing for a long time at that point. KUMALO: I think what began to happen is that we began to organize in constituencies of regular America-and by regular America, constituencies that no one would ignore. I'll give you a case in point. The Lutherans, for instance, played a major role. We wouldn't have gotten the Midwest states of Nebraska, Minnesota, [as well as] Washington state, if it wasn't because of the Lutherans. The Lutherans, they had a Lutheran coalition against apartheid in South Africa, which was Lutheran ministers and lay people led by Joe Barndt, now who's down in California, and Kim Zalent. These people organized within the church. They were unique in that they were saying, " We are Lutherans, and Lutherans are being oppressed." And they were very successful in Namibia. One of the great guys who lived-really, the stories of the '80s cannot be told without talking about Bill Johnston. Bill Johnston was an amazing guy. And I remember he and I being invited by the Lutherans to Tacoma, Washington. And they warned us that we were going to stay at this house of a very conservative Republican, and he was a Reagan Republican, this guy. And they used to have a thing in the West of the United States called the Sagebrush Rebellion. These were conservative [people]-the real Reagan rebellion-but these guys were Lutherans. So we go and stay at this house. This guy is very wealthy, very, very wealthy. Could have been a millionaire. But we stayed in people's homes. So they put us there and said, listen, please, folks, don't discuss U.S. politics. This guy is for Reagan, so you'll spoil the night. And be careful how you talk to him about even politics in South Africa. The guy said, you know, my church raised some money for SWAPO. We support SWAPO. We are sitting there like, oh, my God, this guy supports SWAPO [laughter]. He said we support SWAPO because there are more Lutherans who go to church in the SWAPO camps in Angola and in Namibia than they do in Norway. And he says, SWAPO, you can say anything about them. These are good Lutherans. They tell me SWAPO is communist. No, they are just good Lutherans. So we're sitting there and don't answer! Bill Johnston, bless his soul. Great guy. So organizing those people, the Lutheran church used to have the American Lutheran Church, which was a progressive one. But they used to have another one called the Missouri Synod, which was a conservative church. They've since tried to merge. They have the ELCA [Evangelical Lutheran Church in America]. But these were Midwestern people. These were people who didn't get too much involved in anything controversial. And they were very instrumental in bringing up the issues of South Africa in the Midwest. And Wartburg College, of course, in Iowa, started bringing students from South Africa and Namibia who were Lutheran. The thing we had to show to the Americans was that the people in South Africa were not different from them, especially black South Africans, were just no different from them. So once people got that, then the injustice stood out. Once they realized these are regular people, then the injustice stood out. The other thing that was very important was the state and local campaign, which I ran with the folks at the Africa Fund. At one point we had bills on South Africa in the state legislatures, more than 40 legislatures. And if you look back today, the states that were successful in passing these bills, there is not one among them where the bill was just introduced either by a black legislator only or a white legislator only. It was always two legislators, one white, one black. And if you had that combination, the bills passed. In Michigan there was State Representative Perry Bullard and State Senator Virgil Smith. And in Massachusetts, of course, you had State Senator Mel King and State Senator Jack Backman. So the issue forced us to address the issues of race and class right here, in a nice, soft way. In Missouri we had a coalition that had Arabs, Jews, and Catholics, and right- wingers. These guys, if they discussed anything else they would be at each other's throat. But when it was South Africa, they were together. In fact, when we went to their state legislator-I can't remember who it was now-the legislators were amazed because the guy we put up front was a right-winger guy who you knew wasn't going to be talking about black folks if he had any chance. But he had been to South Africa. He was a cameraman for a TV company, had seen South African police brutalize people in a peaceful march. He was revolted. And when they brought him, then I took him with us on a delegation to the state capitol, and we put him up first. These conservatives who were going to come there and call us names were stumped because this guy was a regular guy. They couldn't get out of him. And it forced the conservatives to negotiate on these bills, so they were forced to do that. And the other thing which I think now, on reflection, now that I work at the U.N., was very important-the Africa Fund always attended those state and local conferences. People like Maxine Waters, who is now in Congress. I met Maxine Waters when she was still in California as an assemblywoman. And we did South Africa then and she moved on to Congress. Up to this day Maxine will say, when she sees President [Thabo] Mbeki, you know, Kumalo is the one who really got me into this thing [the state and local action campaign]. So we cultivated people for a long time. And these people were able on their own-when the chips were down, they were calling their people because it was their issue now. It was no longer our issue; it was their issue. They had bought into it and this was something that they personally felt was their issue and they were going to do something about it. Ron Wyden, who is now a U.S. senator in Oregon, was a student at Oregon State University in Corvallis, organized the students there, went into the state legislature. He's a U.S. senator now. So you can see these guys-we stayed with them over the years. And I think the thing that the Africa Fund did which won't be recognized for a long time is that at the Africa Fund we didn't have money. And in fact when we think now, shoestring budget, we had nothing. But the Africa Fund had the ability to take the issue and make the issue a local issue. We didn't go there and be experts for the people, but we made the people become experts on the issue. So everywhere the people themselves would articulate. And it carries a lot of weight if Joe Soap who lives around the block stands up and gives an incredible speech about why people in South Africa should be free, and all because the information from the Africa Fund made him feel strong. Very moving. It was very moving indeed. Q: It sounds like there was a conscious decision made come the '80s to take this local, whereas in the '70s, by and large, it had been the Washington Office on Africa, the Washington this and Washington that. KUMALO: In the '80s it went local. And the Africa Fund took it local. I told you about the state and local campaign. The other campaign that even localized it more was COBLSA, we called it-Campaign to Stop Banking Loans to South Africa. And Prexy Nesbitt and Gail [Hovey] and myself were involved in that. What that did was it made people ask themselves a simple question: the money I put in this bank, does it go for loans in South Africa? And of course we had these guys who could research, people like Beate Klein, and all those people who could do research into where these loans were invested. As a result there were demonstrations in places like Wyoming. In Wyoming, people would go picket the local bank about South Africa. First of all, picketing in Wyoming is like, what is this? What? South Africa? Where is that? But the people who are picketing are local neighbors. So you had local people, it became local, the local radio station, the local thing, South Africa, let's talk to the Africa Fund. I can't imagine how much traveling I did in those days. But this was the thing. And we traveled all over the country, but it became a local thing. And it wasn't run by South Africans in the U.S. or the people outside doing it. It became a local campaign, a homegrown campaign. And all Africa Fund did was provide information. Q: Now tell me about the Free South Africa Movement and, as you see it, the strengths and weaknesses of that. KUMALO: Well, the Free South Africa Movement, of course it was a drama. The drama was the Free South Africa Movement and the people getting arrested, the big names. That was important because you needed all levels, but the people who got arrested and were on the six o'clock news and all that were the people that had been cultivated by the Africa Fund. So it was good to have these different divisions. The weakness of it is that it was very celebrity-oriented, but the fact that it was celebrity-oriented gave even more momentum to the people at grassroots level. When TransAfrica, for instance, and Randall Robinson and these guys would do things in Washington, for some African American leaders it was very important. But don't forget people like Rev. Dr. Wyatt T. Walker of the Canaan Baptist Church, who were organizing the churches around the country, the African American churches. The thing about it is that it was everybody. And the issue was so rich that people didn't get a chance of looking at each other and fighting among themselves. Let me give you an example. There was a woman in St. Louis who was representing Bill Lucy, secretary- general of AFSCME [American Federation of State, County, and Municipal Employees] and president of the Coalition of Black Trade Unions. She was radical, I mean radical African American. And she used to come in and say, you see what's wrong with you, Kumalo, is that you keep on telling these people that these demonstrations are going to make a difference. You have to start killing white babies. You kill enough white babies in South Africa, you'd be free tomorrow. And I'd say yeah, yeah, but at the meeting, we're not going to raise it. She was very good, she didn't raise the one about white babies. But this was her private solution. But in the coalition, it was about getting Missouri, getting the senators and all these guys in the state, the colleges, the pension funds. That also caught the attention of the people, because once you start to ask about the pension funds, then you had more people wanting to become involved-" it's my pension, can my pension be invested in South Africa?" So bringing the struggle to the local, to the grassroots, was really, really important. And of course there were other discussions that were there, but they all-in the end, it all went to help. It worked. You're talking to me now as ambassador, so remember, it worked. Q: You mentioned the diversity of the movement. Tell me a little bit about that, the political, racial diversity. You're describing it as one of the strengths, but it was also extremely difficult at times? KUMALO: It was very, very difficult. Oh, my God, it was very, very-but the Africa Fund, we insisted on it, that we had to involve [diverse groups]. There were many cities where I would go and I would stay with very progressive people who were white, and they were not linked up with other progressives on the other side of town who were black. And I would insist, we are going to have a joint meeting. And of course one side would tell me this, the other side would tell me that. But because the issue was the rich issue on the table, then they eventually began to work-and we helped them form coalitions. We really helped them forge coalitions. The most difficult one was also the college campuses, because the white student group would have all the money, so they could afford my ticket to come to their campus. And the black student group would not be involved. So I always insisted, when I got to a college, I must go talk to the black college group. Oh, they are not interested, I was told. I said, well, fine. They have a radio station, [because] the colleges pacify black kids by giving them their radio station. It wasn't hip-hop in those days, but whatever-the R& B music. So there would always be a straight R& B station which is run by the African American student club or something. And I'd go there and they'd say, oh, no, we don't do interviews. I'd say, no, you have to do interviews. You know we have musicians, too. And then suddenly these kids come out in large numbers. But we always used to-the colleges were the most difficult to do that. Q: The most racially divided, you're saying? KUMALO: They were the most racially divided. There were three races, in a funny way. There would be the black students, the white students, and the college athletes. The college athletes were a group by themselves. And I remember in North Carolina I said, no, I want to go see athletes because my kid was watching basketball. They may be interested in South Africa. Oh, these are college athletes. They're interested only in this. But let me go talk to them. And I'd go talk to them and they suddenly realize this is the same thing, and they become involved. But the American campuses are very segregated. Really, they are very segregated. But this was one campaign-and again, the guy who was responsible for that was Josh Nessen. He used to always-even now, when it's February I think about Josh. Always two weeks of action and this led to campus demonstrations. So I mean the most moving thing, I travel around the country these days, and people come to me and say, you don't remember me, but I was a student in whatever-in the '80s, and now I'm an executive of a company. But you came and spoke at my college on South Africa. It's very moving, sometimes very surprising. I still meet people who say, I remember you. The colleges were very segregated and the issue of South Africa really brought them together. And Josh Nessen was very good in that. And of course the guy who anchored the whole machinery was Richard Knight, because Richard Knight, with his information, and he was always-he's the most disorganized guy I ever know, but the most organized at the same time. And then of course the late Paul Irish was the strategist. Paul was always thinking of what are the ways in which we can try and impact on these people. But remember, we got most of the basic pillars of local society. We had the churches, we had the students, we had the state legislators, we had the banks. We had the housewives in North Dallas. We went to Dallas, and beyond the freeway where they have Martin Luther King Highway where the black folks are, the church is the only thing. But suddenly one of the women in the church was friendly with one of the high society ladies in North Dallas, and she said, " Why don't you do a thing for your women's thing and invite Kumalo? He'll come with a movie." And so we showed the movie, South Africa Belongs to Us, to these white women who were wives of very wealthy Texans. Halfway through the thing they were weeping because finally it hit them that these women in South Africa were no different. There was a scene in one of these movies, South Africa Belongs to Us, where the woman is a domestic in South Africa [separated from her husband because of South Africa's pass laws]. And the impact just grows on you because she's speaking in Zulu and there's a voice, of course, interpreting on tape, and she reaches a point where she says, oh, I miss my husband, that I don't have time with my husband, that I don't have time to talk to my husband. Then the person says, well, why do you miss being with your husband? So she says, because I just miss talking to him. And these rich women start weeping because that's what husbands and wives do sometimes, just talk to each other. This woman was being denied the most basic thing. That is beyond race, beyond class. It just touched them in a way that-I had never understood it, because we used to watch this thing all over again. I thought they would be impressed about Winnie Mandela who was suffering, was in the movie, or Mrs. Sobukwe who was also in the movie. I think even Mrs. Sisulu was in it. No, but it was this very poor woman, a domestic, who sits there and just simply says, the fact that I'm separated from my husband, I'm denied a chance just to talk to him. And these women, you could hear them gasp. It was like, wow, is this what apartheid does to you? And no amount of literature would have done that. My speech was easy after that. Q: To what degree was the anti-apartheid movement part of a broader Pan African or international solidarity effort? People didn't see necessarily that part of it. KUMALO: No, no, they didn't. But you see, listen, we were about producing results. Some of these international Pan African movements were more steeped in ideology and doing things right. It's always made me reserved about intellectuals up to this day because they want to think things through right. We're about doing things. Really we were about, you know, there's a meeting in this town, we'll go do something. Not thinking it through. The African Studies Association used to meet. Once, I went to one of their meetings and I said, oh, please, never send me there again. Because these guys are into how to think it through. Africa Fund sent me once to a meeting in Germany, I think it was in Frankfurt. The people who worked in Europe, if you look at the linkages-we linked up with ELSA, which was End Loans to South Africa campaign, with Mike Terry and them in London, because those guys did things. They were very, very successful in the U.K. We linked up with the Dutch. I forget what the Dutch [groups] were called. And they were in Rotterdam and they used to do their oil [sanctions]. They were very, very active people. And then there was a group of people in Switzerland who were also very, very active. But there were all these movements around, but they were really about trying to figure out the struggle right and put it in historical context. Give me a break. If you look at the archives of the Africa Fund, you'll probably find more activity. These were the events we were active in. This is what we were doing. We were more active. We were activists. We were out there to do things, not to really try and figure them out. Q: You've mentioned as influences the J. P. Stevens organizing efforts. What about the influence of African liberation figures or movements on American activists? Was there much? KUMALO: No, not much, because there was confusion. You see, the most active group on the ground-well, let's see. Let's see. The most active groups were, like we said, the Tim Smith organization [Interfaith Center on Corporate Responsibility]. They were seen as whites, the whites are running this thing. There was Africa Fund. Even though Jennifer [Davis] was South African, there were all these [white Americans]. I used to get grief about always being with all these whites. I said, well, you know, they work. Funny, when people discovered what these guys were doing, they got beyond that. Because remember, this is a racist country on its own. I'm not supposed to say that as a diplomat [ laughter]. Whoops, I'm a diplomat now. But this country had its own racism. We can't run away from it. Racist in nature. One of the guys I respected a lot was a state legislator in Alabama. He said to me one day, he said, you know, you guys are doing something which is very difficult for us African Americans to do because you are going to states and asking states to take action. We believe more in the federal government because of the state rights movements that the KKK [Ku Klux Klan] and all these people used to do, and all that. So we had to educate Americans that it was okay for a state to take action on South Africa. They would oppose us because they would think that that if you let states do this-and they go back to the history of this country where states had done things that they shouldn't have done. So it was very amazing. So we had a lot of education to do here. And the fact that we had people of all races was also very confusing. I think the fact that I was there and Prexy was there, it helped. It really helped, because we were more into action. Once you get people to do things, then they don't have to try and analyze and think, are we right? Are we combined right? The Lutheran Coalition on South Africa-they were all whites. But the Lutheran Church, they used to say this and it's true up to today: the few blacks who join the Lutheran Church-there are very few-they join there not because they see themselves as being so black, but because they want to be in this upper, hoity-toity church rather than be in a Baptist church. So they wouldn't be active. And in fact, I would be the one going to lobby them-because some of them were in very high positions-and saying, why don't you join with us? And they say, what are you doing with these white guys? I'd say, this is what these white guys are doing. So I spent more time interpreting Americans to Americans so they could join with us in doing what we wanted. And once they understood, they became solid. And in fact they became more angry because then they realized, my God, is this what we've been missing? So they were more connected about it. But the other African American groups were very suspicious. Who are these people and this movement? But because we did things-and I used to organize-the National Coalition of State Legislators used to have these meetings that they had. And I would go to these meetings every year, and the black mayors, and these people, especially the black mayors, they would be very surprised that people expect them to pronounce on these important issues. Really? No, we need you to do this. One other thing I used to do at the black state legislators conference-I was just laughing the other day. Philip Morris, the cigarette people, they used to be the biggest entertainers of state legislators in those days. I remember one time in Seattle, they had this yacht, this hoity-toity yacht, with all the best booze, the best food, and all the African American legislators, because Philip Morris wanted them on their side. So one of them invited me. The Philip Morris folks were very suspicious, Why is this guy coming in? And of course it's booze and what have you, and card games and promises. There's always sailing on Puget Sound. And halfway through, one of my friends says, man, yeah, we've heard about all this apartheid. We support this [protest]. This black guy, he was vice president of Philip Morris. We support you. But this time we want to hear from Kumalo now about the real struggle against apartheid in South Africa. So here I was sailing on this yacht that Philip Morris has paid for, doing anti- apartheid work. The good thing about African American elected officials in particular was because they represented then, in those days, safe districts, you knew they would always be there. They would always get reelected. And so if you cultivated them well-they also moved up in seniority, so within a short time you just had people in the right places. [Reagan's effort to undermine sanctions came] at the wrong time for him because by that time-I think it was '86 or something like that-by that time we had done the work. We had had five, six years of really preparing the ground. So we had people in every corner in every neighborhood who were willing to rise and say this is not the way it should be done. Q: What gave you the idea to go local? KUMALO: I wish I could say I thought about it, but it started in the Africa Fund. I think it may have been Paul Irish. Oh, actually, one of the things I remember most was that we got a call-I don't remember how-but we got a call that this senator, Jack Backman, who was a [state] senator in Massachusetts and was leader of the Democrats in the Senate, wanted to learn more about South Africa. And he said, no, I'll come to your office with my staff. State Senator Jack Backman came and we spent a day with him, taking him through the struggle. And out of that we realized that-because that gave them [someone in addition to] Representative Mel King, who some of the people, colleagues in the legislature, saw as a maverick. There was a white legislator saying the same things. In fact I remember the breakthrough came when I was invited by Senator Jack Backman-I think he was leader of the Senate-and he decided I had to say something. Now, this had never happened in the state legislature, that I speak. So the opposition said this has to be debated. But suddenly here they are spending 30 minutes debating about South Africa. Eventually they realize the argument doesn't take them too far. He says, okay, we pass a resolution that only this once, not to be repeated, I should speak. I don't even know what I said. But it began to crystallize. All these [activists] had been working, but this was one level they had not penetrated. So we were penetrating all the levels. But going grassroots is really what changed this country. And the advantage of grassroots is that we would go into any community. In Chicago, I didn't know there were so many Mexicans. There are Mexican stations in Chicago. And there was a Mexican state legislator. So we'd go to the station speaking English, they interpret, and you hope they said the right thing. But they said something right because there is all this communication in Spanish. So grassroots was really the thing. But the Africa Fund came up with it. Q: You talk about how difficult it was to get the white groups and the black groups together. Do you have any sense that those coalitions outlasted the anti-apartheid movement? KUMALO: Oh, yeah, they did. When I was appointed ambassador, there was a story in the New York Times. You can't imagine the messages we got. People now, they're older, they're tourists, and they'll call in [saying] I want to go to South Africa. I say, I'm at the U.N. I don't work in tourism. But they are still there. These people are still there. The shame is that there has never been a movement since that came in to do it. Because these Washington-type bodies, which shall forever remain nameless, they're all intellectually set. They're people who want to figure out the right thing. That's why they don't get anybody excited. If they wanted to get-we could have a constituency in this country on peace and justice in Africa if we wanted to. We as South Africans, now that we are free, we don't do a good job of it. But the groups in this country do not do a good job of it. But the people are still there. Once in a while I still meet people on the road. They remember South Africa. Or I say I'm from South Africa and they will just start telling me their own experiences. " When I was in college, oh yeah, that's the thing, I marched." So it's still there, it's just that there isn't one group that's been a vehicle to tap it. Q: But these multiracial or nonracial groups that came together to do the anti- apartheid work in the '80s, did you have any sense that they went on to do anything else together again? Q: Or did the groups then go their ways? KUMALO: I think they went their way. Like I said, apartheid was a very powerful glue that made people stay together to do things. And also the way that all the groups, whether it's Washington Office [on Africa] or TransAfrica or Africa Fund, ACOA, they all articulated the issue in a way that made people want to come together and do something. [Today] we don't have an issue like that that makes people do that. But it doesn't mean that people are not there. And this senator from Michigan, Virgil Smith, who was a young kid when he started, I saw him maybe two years, three years ago. And he was telling my daughter, oh, the people are still there and they still once in a while come out in his support. We have 10 years of freedom now for South Africa. Throughout the country they had events. People came out, the same coalition people, they still come out once in a while. But there is nobody or no issue or no issue that has been articulated enough to tap on them. But when you have people like [John] Kerry running for president [in 2004] and having one sentence on Africa, what do you expect? Q: -the war, AIDS, you name it. You go right down the line. But the strategy or the effectiveness, as you're saying, is not there. What would you say to them, based on what you've learned and know about how to pursue this? KUMALO: Well, they need to pick one issue. You can't be a movement that addresses everything under the sun. They would have to pick up one issue. And through that issue, articulate the concerns that are universal. The human rights of the people who are dying of HIV/AIDS, the poor, these are all common things. But you need one issue. You need one issue that you can zero in on and say this is one thing that we should do. Here we are sitting in a country, the United States. What is it that the United States would like to contribute? And this is the way we can better people. Okay. The politicians say we bring a better life through democracy we forced on people. But what is it that we can do? I was thinking to myself that even this outpouring on this tsunami thing, in a way it's people [finding] finally something we can just do, which is out there. It's not so much they worry about the poor people who got swallowed by the sea, but it's the act. You feel like part of this movement that is doing something. Let's do something to help these tsunami people. So people are primed, they are ready. But you need someone. And for Americans, who have a very poor attention span, you need a very simplified message. And if you have information, give it in slow doses. They don't do well on complicated information. Move on to another thing. That's what the Africa Fund did so well. We used to produce one sheet of paper that would mobilize many, many people on one issue. We used to have question and answers on investment or question and answers on apartheid. One of the campaigns, which is my favorite, I didn't mention, really my favorite. We had the Unlock Apartheid Jails campaign where we collected keys. Everybody has keys in a bunch that no longer open anything. Finally we said, hey, give up these keys as a symbol to open apartheid jails. We collected thousands of keys. Children, schoolchildren, churches, bars. Everybody was putting up things, put a jar there, drop all the keys you no longer need. Oh, there are people in South Africa who are locked up? We had a one-page thing [saying] there are 40,000 people in jail, some of them are children. How could they do that? It's apartheid. Oh, Jesus, I'm against this apartheid. And you drop in all the keys you don't want. But we collected all these keys and we sent them to the South African Mission in Washington. But it became a thing where mayors were like, we have to have a key of the-we had New York, Washington, L.A., San Francisco, they all came in. Mayors would drop their-Bill Cosby was my chairman, my honorary chairman. Everybody wanted to be associated with-but it was keys which everybody wants to dump, they no longer open anything. But there was a message to it, and people knew that. South Africa, they lock up people for nothing. So when Mandela came out, it confirmed it. You see? This is it. Here's somebody that's [been] locked up. There's a lot that could be done now, but you need a message that's simplified. You need an action message. You need to say to people, if you do this, it has an impact on this. Like that tsunami, you didn't have to understand what a tsunami is like. But people say, well, if I give money-UNICEF has more money than ever. The Red Cross, they can't take any more. But when they say, can we use that money for HIV/AIDS? No, no. My money's for the tsunami. Can we use the money for poverty? No, no, no. So the U.N., they called a meeting the other day. They were showing that the tsunami relief is oversubscribed by 2,000 percent. All these other campaigns, HIV/AIDS, malaria nets that you could buy for $20 [were neglected]. Somebody's giving $100 to tsunami, say, okay, can I give $50 to tsunami and buy nets [with the other $50]? No. Because they don't know about that. Tsunami was-this ocean swallowed people. How could it do that? Let's do something. Q: So as ambassador, give me an idea of how you've used what you learned in the anti- apartheid movement to get something done. KUMALO: Oh, I use that every day in the U.N. Coalition building is the key. I use that every day. If I have an issue, I first look out-it's an African issue, fine. It's no good organizing Africans on an African issue. You're not going to get anywhere [just getting support from] people who agree with you. But can we go to the Latin Americans and see if there's a similar issue they want? Can't we go to the Asians? Can't we go to the Europeans? So that by the time you present it, you want exactly what we had in the Africa Fund. You want somebody from Asia to articulate the problem in Africa and say, I believe in Africa this is-and I don't agree with-then everybody sits out there, this guy is from Asia and he sees the thing. It matters. Because if we say it as Africans, they say of course we have to say it. We have an issue now in regional organizations. The regional organizations are in Europe, the EU [European Union]. And the African Union in Africa. Now, if we went in and said, regionally, the Latin Americans don't have a regional group. The one they have, OAS [Organization of American States], that they hate because it's run by Big Brother. The Asians don't. They have ASEAN [Association of Southeast Asian Nations], and they say, oh, we only talk business. What we do is we look in the African Union. What is it we want? We want to rebuild our countries. You go the Latin Americans: is this what you want to do in Guatemala or Honduras? Of course. Then they stand up and say no, we want the same things that they want because we're doing-it's not all about African Union, but it's about the African Union on another level. But you have to do that because many people, they would have said-apartheid, they couldn't have spelled it. But it was something that was wrong. It was not so much about them than it was an issue, I want this right here. If I were to organize a campaign today, you have to try and not just think about is it good for me here. Americans like to do those things. We're Americans. Nobody cares what matters to America. There's too many of you, you're all rich, you can do what you like. But if you talk about how this in America affects people in other areas and brought them in, then it would be a more powerful movement. But if we say we are Americans, they interpret it as, oh, again, there they go being big and powerful, telling us what to do. They switch off. The challenge is to take your issue and make it someone else's issue. And that's what the local campaign does, it takes the issue. Many of these places I slept in them one night and did not have to go back. But the movement continues. Because suddenly it was their issue. The movement lived. Q: Okay. Well, let me finish by asking you what I was supposed to start with. We started in the middle. Give me a couple-minute personal background-where you were born, where you grew up, the family and community you were in, your education, and what brought you here. KUMALO: I was born in South Africa. I was born in northern Zululand, and my father was a migrant and he came to work in Johannesburg. In fact I always claim Johannesburg is my own city because my father was there in 1926 to build the streets of Johannesburg. The city was 40 years old. He worked in the streets and was a migrant worker. And of course eventually we lived south of Johannesburg. I went to school in South Africa. We lived in a village in Evaton Township. In fact, when you read Tom Lodge and the history of the ANC, many of the meetings took place in our township. When I was a kid, my father sometimes would take me to Jada Square where Nelson Mandela and all these people in the '50s would come and speak. We were south of Johannesburg, so we were like the alternative place where these leaders would come. And we were the largest black township at that time. We grew up with politics. And I went to school. And I worked in the newspaper business, which is where I started getting into trouble with the law and the police. KUMALO: I went to school in Wilberforce School-you know there's a Wilberforce in Ohio or something? I don't remember. They had a sister school and it was an African Methodist Episcopal school. And they had a sister school in South Africa and I corresponded with the University of South Africa. But worked in the newspapers, which is where I started being very active politically. I left newspaper work because the police were getting hot on my heels, and I went to work for an oil company. KUMALO: Total Oil, yes. I went to work for Total Oil. I was their first black marketing executive. I always tell the story about how I was the first black in the executive class, I guess, of the company. And everybody had a white telephone, and they gave me a black telephone. And when I eventually complained, of course they gave me a gray telephone, which is when I left. And I laugh because I went back-now part of Total is owned by black people and I was laughing and telling them that I used to be with this company. But by the '70s the police were really starting to raid me. This was after '76, so they were really going after everybody who they thought was somehow involved. And I was lucky. I came here. But see, I'd gone to Indiana University in Bloomington, and so I knew New York. Q: What were you involved in, in '76, '77? KUMALO: First we had an ANC youth offshoot that was called South African Students Association (SASO), which was a big deal. So that kept me into trouble. And I was very much involved. I was one of the founders of the Union of Black Journalists. The other story that's not told you may want to reflect on is about Michael Fraddy and Danny Schechter. Danny Schechter was a producer for Channel 7 news, ABC News. And they did a documentary on the rise of the trade unions in South Africa, which also was very influential. Those were the days when-ABC Reports, they used to call it-was a big deal. And it really had a tremendous impact. In fact, COSATU [Congress of South African Trade Unions], which is now the major trade union, came from that. But there was another organization before then. I think it was FOSATU or something. The Union of Black Journalists, we had aligned ourselves with them, and we were part of that trade union movement. We organized the students, because we had been involved with Stephen Biko and SASO. And Stephen Biko was important because many of the white colleges-what comes to mind is University of Michigan, Michigan colleges, Wayne State, and the one in Kalamazoo. In order to bring the black and white students, they used Biko. They used the writings of Biko. And then I used to go out there and speak about them. I was lucky to flee in '77. And I came here and I worked with Phelps Stokes Fund for a little bit, and George Houser came and recruited me to come to ACOA. But finally ACOA was doing something I liked. It was just about go out and do something. We never had one day being similar to the next one because we were always doing things. There was always something, some phone call. So it just kept us going and we never cared that there was no money. There were church people. I do not forget the archbishop of Albany, [New York]. I don't know if he's retired now. Bishop Hubbard. And there was one priest there who was- and this guy was very active with a group in Albany. Of course he was getting grief from the monsignor and all these people, so eventually invited me to go talk to the bishops. And through those bishops-and Bishop Hubbard was very active in the Albany area on poverty issues-we were able to link poverty issues with justice issues in South Africa. It became one movement. And they were very much involved because the papal nuncio, they call him, who was based in Canada but covered this district, was very conservative and speaking out against sanctions. But Bishop Hubbard-if you get elected in this New York legislature, down here, it's fine downstate. Upstate it's all Catholic. To have the bishop going with you to go testify on apartheid in the state legislature [makes a difference]. Even those guys who will watch it on closed-circuit [television], they show up because the bishop is there. So there were these things about this movement that none of us sat down [to think about]. I wish I could claim we planned and we were the masters. It happened because it was so informal. And people would change it. There was one issue we never could get over. And I remember when Reagan was really beginning to be strong, and that was the issue of abortion. Man, I was very moved in a way that-I always remember this black church in Chicago. Very progressive black church. And they invited me there, and bible class-in that church it was like 500 people for bible class. And Reagan was running at the time. And South Africa, oh, they were solid. They stood up, they were ANC, we want Mandela out of jail. And we finished, and then they went to talk about abortion at that time. And these people who had been very progressive, they switched. I was stunned. Are these the same people? That was one issue I learned you don't mess up with that one. You lose half your people. A very strange issue. So I'm not too surprised when people say-even now, with these elections. And the other issue which was also very difficult was the campaign against diamonds. I remember in, I think it was Nebraska or Minnesota, these activists were very strong on South Africa. They called me in the room and they say, listen, my friend, we really believe you should be free, but don't mess with diamonds, because when we get married, we want to have diamonds. And they started weeping and said, my mother's diamond, I'll inherit, or I inherited my grandmother's diamond. You can't tell me my grandmother supported apartheid. So those issues are very personal indeed. And the other one which was very difficult, but [happened] thanks to the people in Atlanta, was a Coca-Cola boycott. I never believed in it, because, man, you'd be stuck. I remember outside Houston, those humid, hot Houston days, and we're out picketing-this gleaming, cold Coke machine. Give me a break. Nobody's going to resist, but Thandi Gcabashe, who was also ambassador to Venezuela and is now retired in South Africa, was very big on the Coke boycott. Issues that you just knew you might-Coke, though, has a little bit of success, but diamonds, don't touch it. Abortion, definitely don't touch it. But listen, my friend. We can continue on the phone. The Africa Fund, press release, April 1, 1999. Jennifer Davis, Occasional Communication, World Health Organization Report on HIV/AIDS, September 24, 2003. The American Committee on Africa, founded in 1953, with its affiliated Africa Fund, established in 1966, continued to play a key role along with other newer groups as the anti-apartheid movement in the United States reached its height in the 1980s. For additional background on the organization, see George M. Houser, "Meeting Africa's Challenge: The Story of the American Committee on Africa" (American Committee on Africa, New York, 1976), and the interviews with George Houser and Jennifer Davis in this collection. In 1976 the Amalgamated Clothing and Textile Workers Union (ACTWU) launched an organizing drive against textile giant J. P. Stevens. ACTWU organizer Ray Rogers devised a "corporate campaign," successfully targeting high- profile J. P. Stevens board members and isolating the company from its financial backers. In 1980, J. P. Stevens settled with ACTWU, enabling 3,000 workers in 10 plants in the South to win collective bargaining rights. The Interfaith Center on Corporate Responsibility (http://www.iccr.org) was formed by a coalition of church organizations in 1971. Under its director, Tim Smith, it played a key role in coordinating church pressure on corporations to end their involvement in South Africa. See Robert Kinloch Massie, Loosing the Bonds: The United States and South Africa in the Apartheid Years (New York: Doubleday, 1997) and David Hauck, Meg Voorhees, and Glenn Goldberg, Two Decades of Debate: The Controversy over U.S. Companies in South Africa (Washington, DC: Investor Responsibility Research Center, 1983). Senator Harry Reid, first elected to the U.S. Senate from Nevada in 1986, became leader of the Democratic Party in the Senate in 2004. National Namibia Concerns, including Namibian students and American Lutheran activists, was founded in 1978 at Wartburg Seminary in Dubuque, Iowa, and grew to become a national network with over 11,000 members by the 1980s. After Namibian independence in 1990, it was renamed the Southern Africa Network. It played a key role not only in mobilizing direct support for Namibia but also in mobilizing pressure for sanctions against South Africa. See Edgar Lockwood, " One of God's Irregulars: William Overton Johnston and the Challenge to the Church to Divest from Apartheid South Africa, 1954-1971," Anglican and Episcopal History 71, no. 3 (2002): 411-37 (available at http://www.africanactivist.msu.edu/remembrances.php). The archives of the Episcopal Churchmen for South Africa (later Episcopal Churchpeople for Southern Africa) are at the Yale University Library; a finding aid is available at http://webtext.library.yale.edu/xml2html/divinity.102.con.html. The Michigan divestment campaigns, through 1983, are dealt with extensively in chapter 5 of Janice Love, The U.S. Anti-Apartheid Movement (New York: Praeger, 1985), 161-224. For the campaigns in Massachusetts, see Willard R. Johnson, "Getting Over by Reaching Out: Lessons from the Divestment and Krugerrand Campaigns," Black Scholar 29, no. 1 (1999): 2-19. The Campaign to Oppose Bank Loans to South Africa was founded in 1977 by a coalition of national and local groups, including the American Committee on Africa, the American Friends Service Committee, Clergy and Laity Concerned, the Interfaith Center on Corporate Responsibility, and the Washington Office on Africa, as well as local groups in seven states. See David Hauck, Meg Voorhees, and Glenn Goldberg, Two Decades of Debate: The Controversy over U.S. Companies in South Africa (Washington, DC: Investor Responsibility Information Center, 1983), 127-44. See, for example, Beate Klein, "Bank Loans to South Africa, 1979-mid-1982," Notes and Documents: Special Issue, October 1982, published by the United Nations Centre Against Apartheid, New York. For more background on the Free South Africa Movement, see Randall Robinson, Defending the Spirit: A Black Life in America (New York: Plume, 1998), and the special issue of CrossRoads magazine edited by Joseph Jordan, " That Covenant Was Kept: Lessons of the U.S. Anti-Apartheid Movement" (CrossRoads 50, Oakland, CA, April 1995). The Rev. Wyatt T. Walker was executive secretary of the Southern Christian Leadership Conference (SCLC) from 1960 to 1964, during a key period in the civil rights movement in the South. He has been the senior pastor of the Canaan Baptist Church in New York since 1967, and co-founded, along with Canon Frederick B. Williams, the Religious Action Network of the American Committee on Africa in 1988. Josh Nessen was student coordinator of the American Committee on Africa and the Africa Fund from 1979 to 1988. 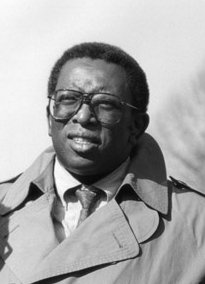 Richard Knight worked at the American Committee on Africa and the Africa Fund from 1975 through January 2001. Paul Irish was associate director from 1974 to 1987. 1980. Video, 35 minutes. Produced by Gerhard Schmidt and directed by Chris Austin. Tom Lodge, Black politics in South Africa since 1945 (London: Longman, 1983). Thandi Luthuli-Gcabashe, a daughter of Nobel laureate Chief Albert Luthuli, was based in Atlanta, Georgia, as director of the Southern Peace Education Program of the American Friends Service Committee from 1981 through 1996. She joined the South African Department of Foreign Affairs in 1998.